Discover a life philosophy for happiness through Reiki art. Reiki Masters Fokke Brink & Maria Kumb provide treatment and training through workshops and private retreats. 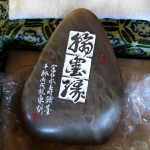 Personalized and unique seals created in meditation and carved from ancient stone. Come to Niki Tianika and experience a Reiki retreat getaway for you or your group. Hidden along the mountainous coast in the Greek Peloponnese, the Niki Tianika Mountain School has a wide range of holiday activities available.